Advanced undergraduate, and graduate students studying chemistry. Introduction.<$> J.L. Vossen,<$> Physical Methods of Film Deposition.<$> J.L. Vossen and J.J. Cuomo,<$> Glow Discharge Sputter Deposition. J.A. Thornton and A.S. Penfold,<$> Cylindrical Magnetron Sputtering. D.B. Fraser,<$> The Sputter and S-Gun Magnetrons. R.K. Waits,<$> Planar Magnetron Sputtering. J.M.E. Harper,<$> Ion Beam Deposition. Chemical Methods of Film Deposition.<$> F.A. Lowenheim,<$> Deposition of Inorganic Films from Solution. W. Kern and V.S. Ban,<$> Chemical Vapor Deposition of Inorganic Thin Films. 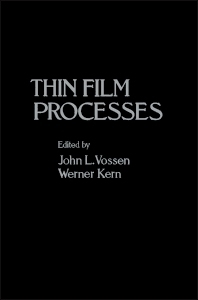 Physical-Chemical Methods of Film Deposition<$> J.R. Hollahan and R.S. Rosler,<$> Plasma Deposition of Inorganic Thin Films. H. Yasuda,<$> Glow Discharge Polymerization. Etching Processes.<$> W. Kern and C.A. Deckert,<$> Chemical Etching. C.M. Melliar-Smith and C.J. Mogab,<$> Plasma-Assisted Etching Techniques for Pattern Delineation. References. Index.